ON TOUR brings you a seven-night 'scenic' Rhine meander. CRUISE INTELLIGENCE this month is a news update and finally it is worth mentioning that this issue is being produced on Oceania Riviera, somewhere in the Eastern Mediterranean. Whilst 2014 has been a tremendous year for the UK cruise marked with 1.7m bookings, 2015 could be even more so. BTN has reported on P & O’s Britannia, with its 3600 lower beds adding 25% to Britain’s largest cruise lines capacity. RCCL Anthem of the Seas comes on-line in the Spring with berths for 4180 passengers, joined later in the year by Norwegian Escape with around the same numbers. The completely new arrival is aimed at a different market. Viking Star is an undertaking by the enormously successful American owned river cruise company that trades under the Norse banner. For 2016 Viking has two more virtually identical ships on order, each offering 928 beds. Viking is taking on a number of established quality cruise lines with ships of under one thousand passenger capacity including (in alphabetical order) Azamara, Crystal, Oceania, Regent, Seabourn and Silversea. A least for the first year it is being careful, confining Viking Star to maiden voyages in Scandinavia and the Baltic; and the Western and Eastern Mediterranean. She begins sailing in May. Unlike other newcomers in recent times Viking has a large base of very satisfied customers from its river cruises. The plan is to replicate the service and offerings that clients have got used too. Viking claims to have sold 90% of capacity for the first year. Converting past customer is part of the campaign. As a direct result of extensive feedback and input from Viking River Cruises passengers the itineraries call for maximum time in port, often with late evenings or overnights, so guests can experience local nightlife or evening performances. Ports include both cosmopolitan cities and “collector ports,” and appeal to those with an interest in history, art and culture. The Viking all-inclusive pricing continues including gratuities (if booked before , shore excursions in each port, beer and wine with lunch and dinner service, free wi-fi; self-service laundry and 24-hour room service. Children are not encouraged and under 12’s not allowed. There is no casino on board. Star is an all veranda ship and includes 14 Explorer two-room suites offering wrap around private verandas. Even what might be termed the ‘basic’ veranda stateroom offers a whopping 270 sq ft. Passengers will have the choice of two swimming pools, a main one with retractable dome and an infinity pool, glass-backed, cantilevered off the stern. The ships on-board venues include a dramatic three-deck atrium where passengers can enjoy musicians playing regional and classical music; the Star Theatre, home of enrichment lectures from scholars and experts; an on-board cooking school where guests can learn local specialties; and the Viking Piano Lounge, the social centre. Viking is offering a variety of cruises from 15 days out of Stockholm to its shortest trip, the traditional Barcelona – Rome western Mediterranean voyage. At 48,000 tones Viking Star is a sleek, yacht like ship. She has even a heliport at the bow. The Viking product is long established and well thought off. Reinvented on the Oceans of the world the competition should be wary. And Scenic – Not as big as Viking but just as ambitious. Scenic dates back to 1986 when Australian Glen Moroney, still very much in charge as Managing Director today, established a package holiday company. In the early 1990s it developed a successful programme of tours across both Australia and New Zealand, followed by Norfolk Island in 1997 and Southern Africa in 1998. By the end of the decade it had expanded to host tours to Canada, Alaska and USA under the banner of Scenic Tours. 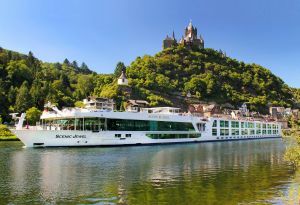 2008 hailed the beginning of a new chapter for the Melbourne based operation with the launch of the up-market Scenic ‘Space-Ships’ river cruisers in Europe. Whilst other operators classify their products de-lux or superior the Scenic statistics stand out. All Rhine and Danube river ships are limited by the size of the locks, 135m x 11m the maximum hull configuration. The Scenic ships only have 85, 10 less than some of their competitors. This means not only the offer the largest standard suites on the rivers but with less passengers more room in the public areas also. All the suites on the two top decks feature full-size private outdoor balconies that uniquely can be indoors too. A large, electrically operated window is outbound of the sliding veranda door. You can be inside or outside in the same place and have your butler serve breakfast any morning. A shoe shine and pressing service is also offered gratis for clients on these decks. It is part of the service. All tipping and gratuities are taken care off. The printed guides and general paperwork supplied is of the highest quality. It all arrives in a Scenic Tours back-pack about a week before the off. Stateroom luxury include Queen size Slumber beds with pillow menu, Egyptian cotton linen, Luxury robes and slippers, L’Occitane products, 32 inch Samsung HD TVs linked to Mac mini computers. With some of the largest suites there are full size baths, but for the majority the ensuite is an exceptional compromise, with glass screens for the shower and a really large wash hand basin. One minor grumble is that the door could fold back further. There is plenty of space. And talking of space the offerings are more than adequate for a seven day cruise. River cruise ships, because of their size, have to a compromise. There is no gym, travellers will be kept busy enough during to day to keep fit, and no doctor (but trained medical staff). At any point you are not far from a hospital. There is a hairdresser on board and a wellness centre. Remarkably Scenic offers four dining possibilities, or even five if you add in the on-deck barbeque offered during the summer. There is the Crystal Restaurant, self service for breakfast (an omelette station is offered) for breakfast and lunch, and full waiter service in the evening. The selection is good, high quality and with a vegetarian selection always available. All alcoholic beverages on board is part of the package (except if you want some exceptional wines) and the wines themselves reflect the areas one is travelling through. What can be achieved in a tiny kitchen is remarkable. Once during the cruise you will be invited to Portobellos, a traditional Italian restaurant and welcomed with a glass of Veuve Clicquot Champagne. Laid out just for a maximum of 30 people this separate area on the lounge deck doubles as the River Café day time with a selection of sandwiches, piazza and delicious cakes. In the evening it is the venue for a superb five course meal complimented by exceptional wines. The talk and chat goes on to the late hours. Table La Rive is tucked away in a quiet section of the Crystal Restaurant. Here again you will be once during the cruise to consume the Chef’s Table degustation, exceptional cuisine. The evenings are quiet with a briefing on the next days activities and occasionally local entertainers. There us a resident pianist. Once docked there is a choice of tours and for the more energetic electric assisted bicycles. Also supplied to every suite is a Scenic Tailormade a unique GPS device which you can hang around your neck when on a trip (or want to know more about a place one is passing). There is an interactive map and commentary. On the organised tours the guide is plugged into the system but if you want to be more independent, just take your time and enjoy the benefit of an expert commentary at set locations. It works on a bike ride too, but you must be careful. Concentrate of the cycling first. Once you get the hang of it a fine gadget.